Let’s have a Spinning in Cowgirl Boots! 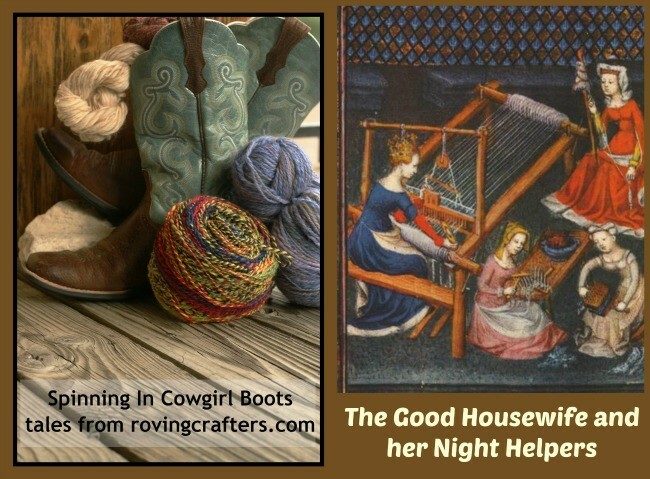 The Good Housewife and Her Night Helpers is a Scottish tale of a woman who was up late at night (again) with her spinning and wished that someone would come to finish it all for her. Unfortunately for her someone did. Actually a dozen someones showed up one night to spin and weave and full (aka felt) and do all her yarn-y chores for her. They also ate her out of house and home, drove her crazy, and wouldn’t leave. And her sluggard of a husband slept through the whole thing. Enjoy this old Scottish folk tale, told as I ply up some handspun yarn while fending off the Anti-Spinning Feline Overlord. Yes, the bad kitty makes a special guest appearance in this Spinning in Cowgirl Boots and does her very best to derail the video… but I manage in the end. P.S. The artwork I show here was not created for The Good Housewife tale. Its an illustration in Des Cleres et Nobles Femmes, a French manuscript published in 1403 by Giovanni Boccaccio. But I thought it fit the story so I used it. P.S.S. If you like these sort of tales, you can find more in my collection of Spinning in Cowgirl Boots posts. 12 Comments on "The Time the Good Fairy Showed up to Finish the Spinning… and how it totally sucked"
What a wonderful story. You are an excellent storyteller which is an art in and of itself. Feline Overlord could definitely handle any faeries. It is not surprising he is Feline Overlord as he is gorgeous and I am certain he know it:) I may be nearing 60, but I have never lost my love of good stories being told by a good storyteller. Thank you!!! Feline Overlord could definitely handle any faeries. She (Overlord is a she and yes, still an Overlord!) does not need to hear any such encouragement. She is a righteous terror already. I can barely hold on to my own dignity and basic human rights with her around! But she is so darn cute. And I’m glad you liked the story. I have to agree, that was a great story !! Now I know how to get rid of those pesky fairies, when they start bugging me. We also have three feline overlords, and they are oh so helpful on that kind of situation. I could sit and watch you spin for hours on end. Thanks for all of your work. Then I’m happy to provide the tale! These spinning and rambling posts are fun to do. And this time I could not help but point out that Bad Kitties >> Bad Fairies any day. Any cat owner would agree I’m sure. No chance faeries, either good or bad, will come to my house. I’ve never gotten out of anything in my life. Now my cats? They are so very lazy I’m not sure they would care. Lazy cats??!! So lazy they wouldn’t chase off faeries? Well, they could always claim to be under that enchanted sleep I suppose. I so enjoy your stories and love watching you spin. You are a natural at story telling. That Feline Overlord is absolutely precious. I have a thing for black cats. Love them! Yes bad kitties are better than fairies any day. Actually, they’re better than a lot of things and/or people I can think of. Bad cats, black cats, any kind of cat; I generally get along better with cats then people. People are just tough to be around sometimes! Glad you liked the tale. 🙂 There should be more old fashioned story telling these days. My Overlord is pretty but I don’t think that matters to her one whit. All she cares about is getting her way. If good looks help with that, fine! Glad you liked the tale. Also glad you think any everyday spoiled housepet is more than a match for a pack of pushy fairies. And just be patient with your young Overlord. in time he will grow up and bully you all over the place, I promise!